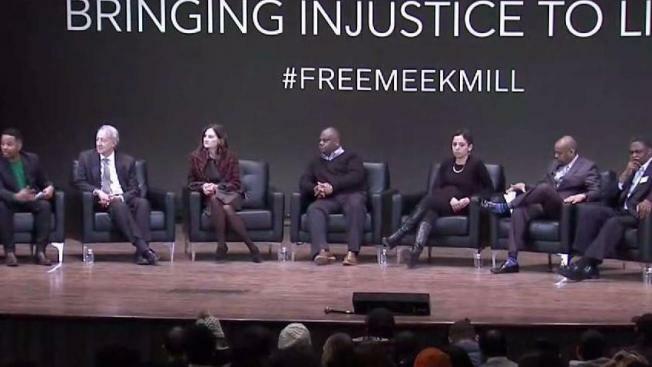 As students and local leaders gathered at the University of Pennsylvania today to discuss justice and race, Philadelphia-born rapper Meek Mill called in to the forum from his Chester prison and thanked his supporters. Mill's attorney, mother, and Reverend Al Sharpton were all in attendance. Jailed Philadelphia rapper Meek Mill made a surprise appearance by phone Tuesday afternoon at the University of Pennsylvania during a criminal justice reform panel. His lawyer, Joe Tacopina, called Mill on the phone while addressing a packed auditorium. With Mill’s mother and the Rev. Al Sharpton standing on either side, Tacopina told the musician that millions of people believe in him. Sharpton visited Mill in his Chester County prison and spoke at length with the 30-year-old. He called Mill’s two- to four-year sentence for violating probation on a roughly decade-old gun and drug case a symbol of racial disparities. Before the panel, Mill’s mother, Kathy Williams, called on Philadelphia District Attorney Larry Krasner to help free her son. Krasner, a Democrat who took office in January, has made criminal justice reform a top priority. Earlier this month, he announced the appointment of a juvenile justice advocate and lawyer who worked under President Barack Obama. Krasner also ended cash bail for low-level offenders, saying that many people languish behind bars simply because they cannot afford to pay their way out. Despite these efforts and other efforts, Mill has remained behind bars. Earlier this week, his attorney filed a motion to release Mill after Krasner’s office released the names of corrupt Philadelphia police. One of the officer’s involved in Mill’s arrest was on that list. Previously, Mill’s lawyers have unsuccessfully appealed multiple times, and have also called for the judge to step aside because "there was an FBI investigation" into her conduct. The judge, in turn, threatened to sue Mill. Correction (March 14, 9:28 a.m. ET): Meek Mill’s attorney, Joe Tacopina, was misidentified in an earlier version of this story.